Attaching the Foundation “bead only” Strip is a very easy step. It only takes about 15-20 minutes. With the outline strip already in place you are ready to set the foundation for your rails. This is the easiest strip to position as it has a support both vertically sitting on the bottom panel as well as against the outline strip. 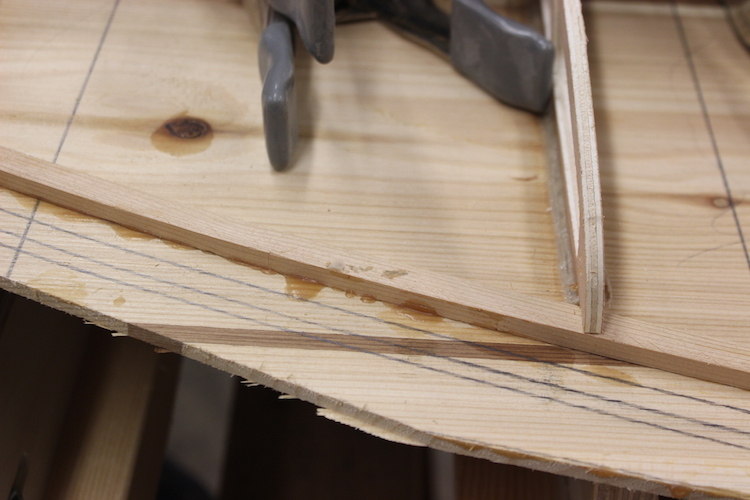 Since this strip is being bent this time in the narrow (1/4″) direction it will usually require little-to-no steam. Outline strip should be in place and fully dried. Here is a small length of a Foundation Strip. It should have 3 flat sides and 1 convex curve. Remove all the spring clamps from clamping the outline strip. The infield of the bottom panel is a handy spot to store clamps not in use during the whole process of building strip & feather rails. It keeps the clamps close to where they will be needed. The first step is simply removing any glue that squeeze out from the Outline Strip so that the Foundation Strip sits on a solid base. A sharp chisel is your best tool choice for this task. 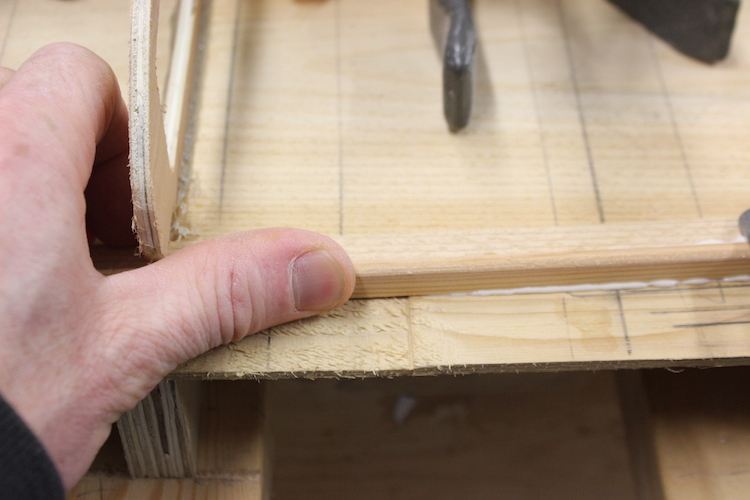 You can drag the back of your Chisel as a makeshift 1/4″ cabinet scraper to quickly clean up any squeeze out. 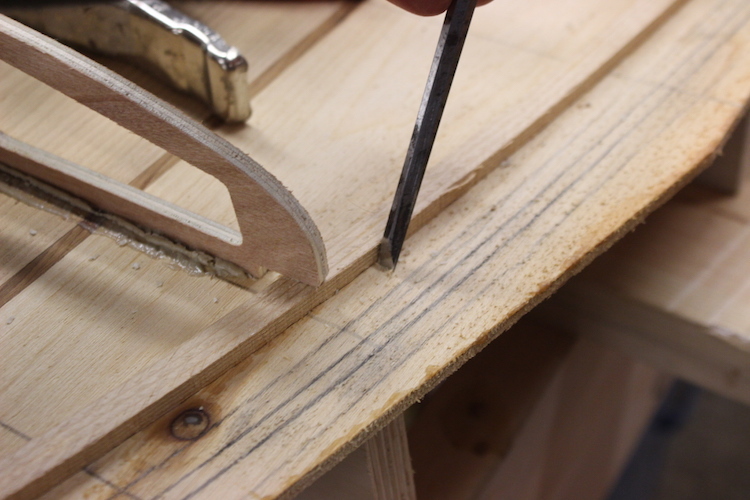 Using a chisel in this fashion has very little chance on catching any wood grain. The chisel pictured is travelling from the bottom left corner of the photo towards the top right. 2. 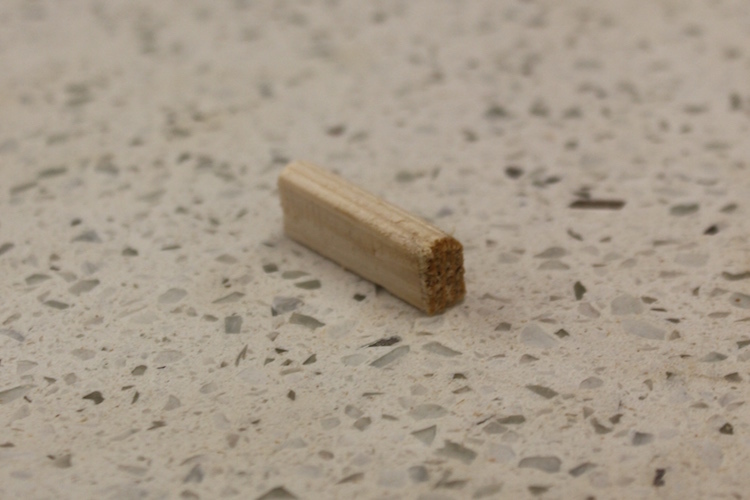 The foundation strip is the only strip that is easier to apply the glue directly to the board. The 4 nails that are being used to anchor the panel to the rocker table come in handy keeping the narrow strips from ending up the floor. This is more important with the strips to come that already have glue in the cove! 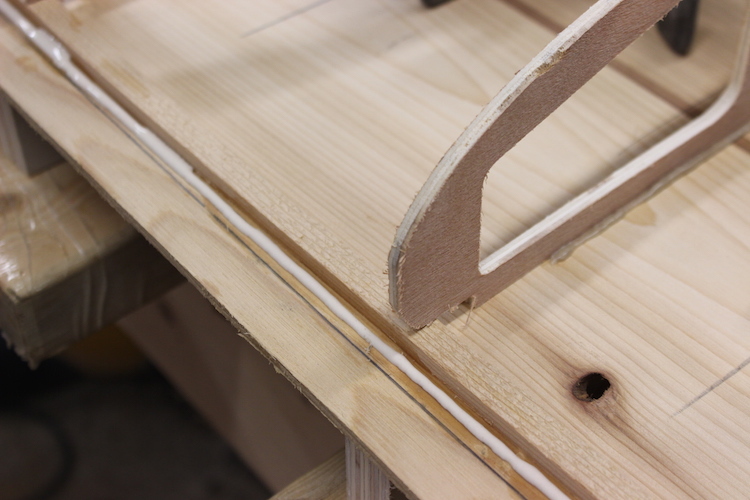 You can use the nails to simulate the right curvature to approximate the correct fore/aft position of each strip. 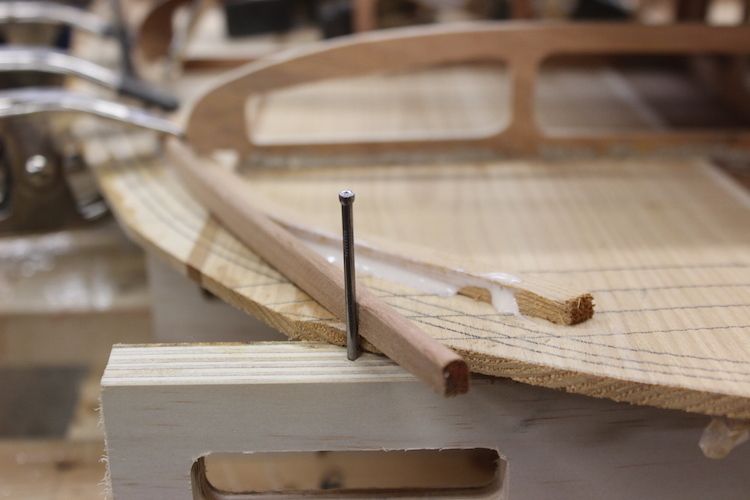 Start clamping from the centre and work towards the nose and tail. Use one hand to keep constant pressure down and inward and set clamps behind the pressure with the other hand. Once you get the hang of this method is fast and smooth. By keeping constant pressure (The thumb never comes off the strip) you ensure that you will get a nice fair curve with no gaps. 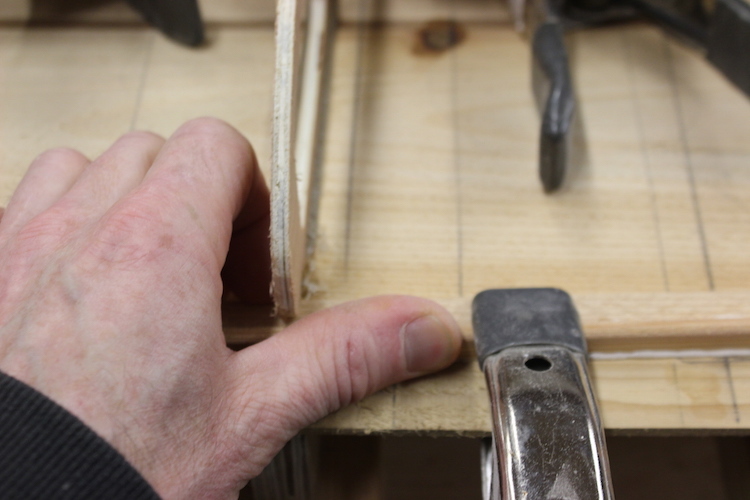 The clamp is added as the hand slides along the strip to the next clamping position. If your hand comes off by accident, simply return to the last positioned clamp and start again. This method avoids any gaps between the outline strip and the foundation strip. With a nice VG strips like the one pictured you probably will not require any steam. 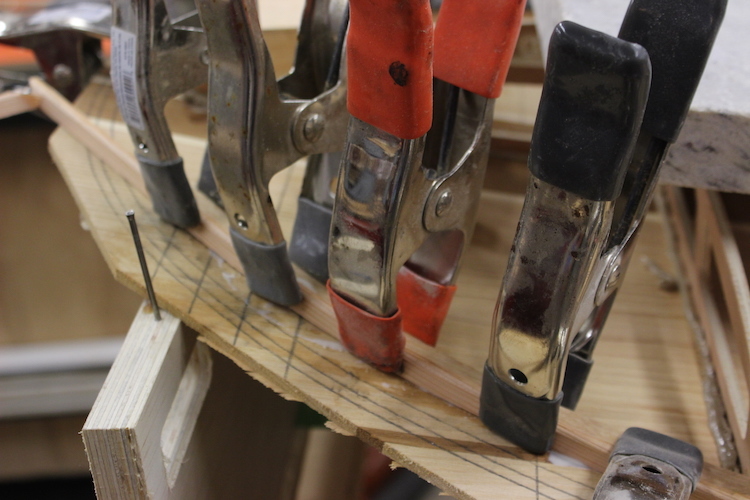 Using the constant pressure technique (thumb pressure followed by clamps) you can tell how much pressure is required to flex the strip. You can feel if steam is required by the amount of pressure you feel. No steam was required in board in this tutorial. If you are too aggressive and a strip cracks or breaks don’t worry it is easily remedied. You can remove your broken piece and try again with a new strip or cut a scarf joint with a Razor Saw and add a new section. Scarf broken strips on a 45-degree angle you clamp the two pieces together and cut them at the same time. The joint will fit together perfectly no mater what the exact angle really is. Try to position the more flexed side is trapped by the less flexed scarf. The last 4 clamps were all added in the vertical position closely following the thumb pressure. It helps to slowly stress the strip with increased pressure and allow it to relax into position. 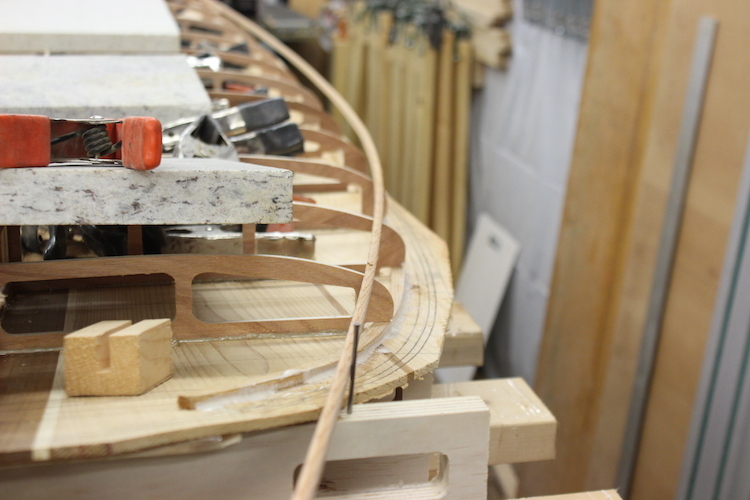 As the curve increases a closer clamping schedule is required to reduce stress and any chance of the strip breaking. 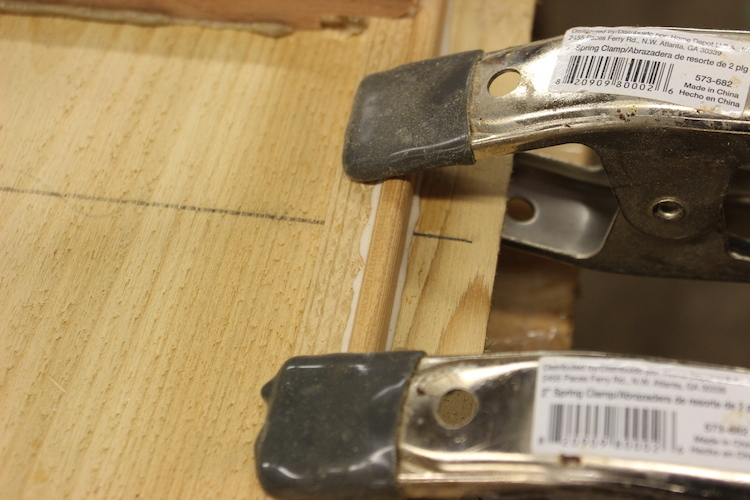 The clamps above are position just far enough apart to allow a clamp to be added pressing down between them. You can see in this photo that the excess strip can be simply snapped to length, as it will be trimmed later when you add the nose and tail blocking. The final step is to have a look at your completed rail and make sure that it is fitting tightly were you want it. 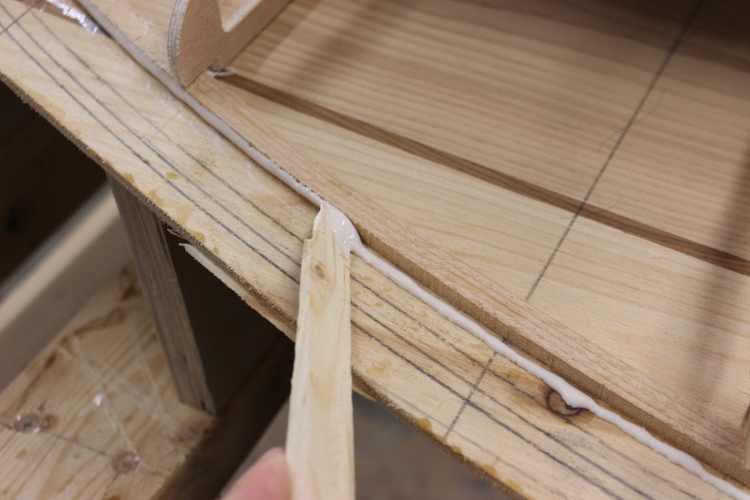 I use the tip of a wooden wedge to clean up glue squeeze out that will interfere with the next strip. 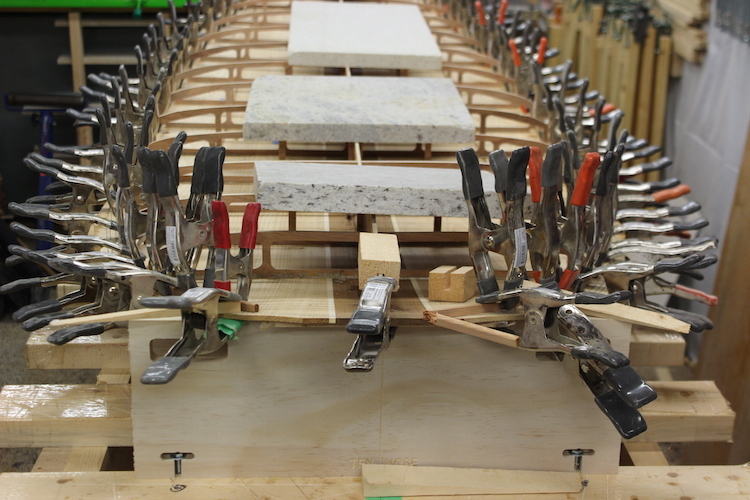 The left side will stop the next cove from sitting flush; the glue on the right doesn’t matter, as it will be removed with the excess material. It is much easier to remove excess glue when it is still wet.